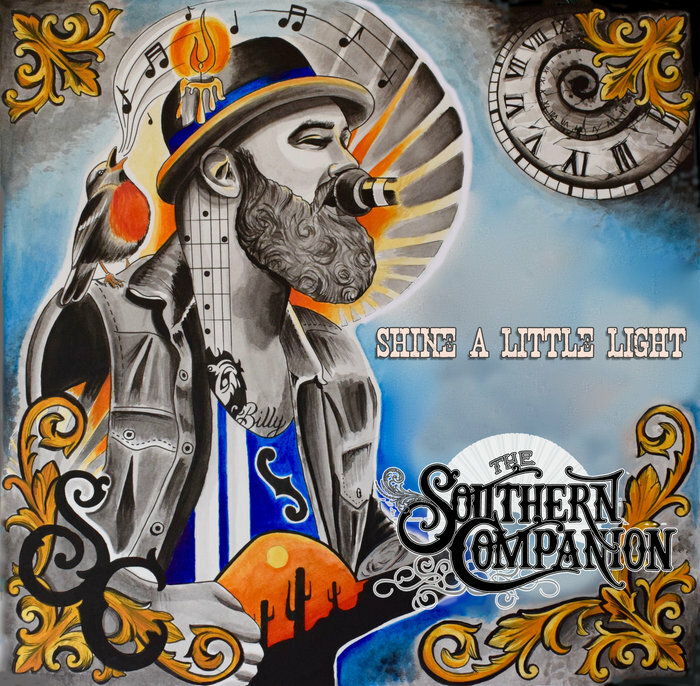 ‘Shine A Light’ is the highly anticipated third album from the multi award winning UK Country and Americana band The Southern Companion. Their last album ‘1000 Days Of Rain‘ won the BCMA Album of the year in 2106, with the band also picking up the Horizon award for best newcomer. Darren Hodson and co-founder Simon Johnson are joined by their excellent band, all with a huge wealth of talent and experience. They have spent many hours on the road in the last few years, with members of the band also on tour with British music legends including Lulu and Tom Jones. All of which made it difficult to get together to write and record the new album. I’m pleased to report that the new album is a highly crafted, vibrant and heartfelt collection of songs, often inspired by home, family and life on the road. The musicianship, production and arrangements are first class as well. The artwork on the album cover and the CD is designed by Darren’s sister Becky Barrow, who is a very talented artist. The album begins with the Springsteenesque ‘Billy’s Brother’ with it’s strong narrative and retro country rock feel. A difficult family life, dreaming of life in a successful band, a Pontiac Firebird and finally a tragic accident. Next up is the classy and wonderful piano ballad ‘Can I Get A Witness’, which has some lovely harmonies and pedal steel. It has touches of Van Morrison, CSNY The Eagles and Jackson Browne. One of the stand-out tracks on album and a personal favourite is ‘Songbird’, which was written for Darren’s young daughter as she started school. It is a beautiful heartfelt track full of love and encouragement. The stripped and intimate ‘Few Too Many Hours’ features just Darren and his acoustic guitar. It has alcohol and it’s related issues as it central theme, which is always a popular subject in Country and Americana songs. Another standout is ‘Great American Mistake’. Life on tour in the US and missing home is explored here. I love the underpinning pedal steel arrangement. At just under five and a half minutes ‘Lie To Me’ is the longest track on the album. It’s a smooth Southern country rock and soul classic, complete with a super guitar solo and catchy chorus. ‘Already Gone’ is another mid-tempo song about life on the road and loneliness away from family and friends. Constantly living out of a suitcase, staying in soulless generic hotels with paper thin walls and always thinking of home. Coming in at less than a minute is short and sweet ‘And In The End’, discussing the end of a very close relationship and the problem of dividing up friends. The album closes with the positive, optimistic and forward looking ‘Last Rays Of The Sun’. It is going to very busy for the band in February and March as they have a UK tour planned. Their London date is on Feb 28th at The Half Moon in Putney with the excellent Lisa Wright and Laura Oakes as their special guests. A super night in store and very highly recommended by us. See you there.